New Planning Regulator lacks ability to regulate. Climate Change Bill is ‘designed to fail’ - Urgent improvements required– An Taisce. 30kph Speed Limits will save lives and promote Active Travel! Mobilisation for CoP21 in Paris, December 2015. The keynote speaker is Lidy Nacpil, convener of the Philippines Movement for Climate Justice, Director for Jubilee South and a member of the Global Campaign to Demand Climate Justice. There will also be speakers from Trócaire, Oxfam and An Taisce. Oisin Coghlan from Friends of the Earth will be chairing. An Taisce is a member organisation of Stop Climate Chaos. The Climate Bill is due in the Dáil next week. But it's too weak to deliver the low-carbon future it promises. The email asks them to at least support the simple changes proposed by the all-party Oireachtas environment committee. It also asks them to come over to Buswells Hotel next Tuesday, the 10th, where Stop Climate Chaos will be hosting briefings with individual TDs from 11am to 8pm. If you can come to Buswells next Tuesday, please do follow-up the email with a phone call to your TDs' offices in Leinster House (01-6183000) to tell them you'll be there and that you'd like to meet them. Do let us know if your TD agrees to meet you. We’ve had a great response so far and I'm looking forward to seeing many Stop Climate Chaos supporters there next Tuesday. We need to Fix The Bill, and with your help we can. P.S. Please take a moment to email your TDs - no matter whether you can come to Buswells or not. Every email will encourage them to pay attention to the Climate Bill. P.P.S If you can't come during the working day we're having Public Meeting in Buswells at 6.30pm on Tuesday. The keynote speaker is Lidy Nacpil, convener of the Philippines Movement for Climate Justice, Director for Jubilee South and a member of the Global Campaign to Demand Climate Justice. There will also be speakers from Trócaire, Oxfam and An Taisce. Oisin Coghlan from Friends of the Earth will be chairing. The first An Taisce Green Communities event for 2015 will be a visit to the Millennium Community Garden, Coolmine, Blanchardstown, Dublin 15, on Saturday the 14th of February at 11 am. The garden is located in Millennium Park, beside Fingal County Council Offices, Blanchardstown. Any bus that takes you to Blanchardstown Shopping centre will leave you within a few minutes walk - Cross the road from the shopping centre towards Draiocht theatre and past the Council Offices, turn right and we'll have signs out from there. Illustrated talk by Dr. Éimear O’Connor, art historian. Event starts at 8pm. Illustrated talk by Paul Kiernan, Welfare Officer of the Irish Whale & Dolphin Group. An Taisce makes a renewed call on the government to take rural settlement seriously in the upcoming review of the National Spatial Strategy. An Taisce, The National Trust for Ireland, has long voiced concerns as to the ongoing suburbanisation of rural Ireland and the consequent decline of rural towns and villages. In our submission to the National Spatial Strategy as far back as 2001, An Taisce argued that in the absence of clear, proactive policies to prevent rural sprawl, major cities and their hinterlands would continue to grow disproportionally to the detriment of rural Ireland. Unfortunately, this has proven to be the case and large parts of rural Ireland have been disadvantaged as a result. Despite short-term pressures to increase housing supply, simply building ever more randomly located houses will not reverse this trend. However, today in many counties, dispersed single dwellings often represent the majority of new houses permitted. The recent report of the Commission for Economic Development of Rural Areas (CEDRA) completely sidesteps the fundamental importance of settlement patterns in achieving balanced regional development. Despite persistent criticism for speaking out on this issue, An Taisce will continue to advocate a vision for settlement patterns in rural Ireland - an alternative vision for creating and maintaining sustainable and thriving rural communities. A strong network of thriving towns and villages is fundamental for rural development. Scattered housing in unserviced locations should be restricted and instead directed to rural towns and villages. Implement a 'Serviced Sites Initiative' in rural towns and villages as an alternative to scattered housing. Rural Ireland is a critical resource for a post-carbon world. Manage the economic, social and environmental legacy of scattered housing. None of these principles are radical. In fact, they are all supported by numerous national planning policy documents, which continue to be widely ignored or selectively applied in practice. The evidence clearly shows that the highly dispersed settlement patterns that have been allowed to take hold are extremely costly. They have stored up significant social, economic and environmental problems that are to the long-term detriment of rural communities and the rural economy. We understand there is no single 'rural Ireland', but a highly heterogeneous space encompassing suburbanised commuter regions which are under severe development pressures and more remote regions which are experiencing long-term population decline. However, An Taisce believes that these five principles can be applied in all contexts to create a better and more resilient future for rural communities. In the absence of such principles, rural decline is likely to continue unchecked. An Taisce is making a renewed call on the government to take rural spatial settlement seriously in the upcoming review of the National Spatial Strategy and curb the costly and piecemeal suburbanisation of the Irish countryside. The closed dates for burning and vegetation cutting (1 March to 31 August) are based in a generic way on what the Department of Arts, Heritage and the Gaeltacht calls the generally recognised nesting and breeding period for wild birds. Any shortening of the closed period under section 40 of the Wildlife Acts would evidently have serious adverse consequences for Ireland’s already threatened and declining biodiversity, and this should not be countenanced by government, notwithstanding pressure from industry lobby groups. Indeed, there is a strong case based on the precautionary principle for an extension in the closed period to protect early nesting/breeding species and the nest building period, not least against the backdrop of climate change and phenological changes. At the other end of the closed period it is clear that many farmland bird species in Ireland nest well into August and certain (namely the Yellowhammer) into September. Likewise in the case of burning controls in respect of ground-nesting birds, the hen harrier nests well into September. In the absence of detailed phenological data for Ireland, An Taisce would support applying the precautionary principle (one of the core principles of EU environmental law, enshrined in the Treaty) such that the closed period is extended at both ends of the current closed period, to cover the period February through September inclusive. In addition to protecting birds and other wildlife during the breeding season, this would have the beneficial effect of protecting valuable food resources for wildlife, since vegetation can be laden with berries and other food well into September. In addition, An Taisce would support a review of the manifold exemptions which apply in respect of the closed period under the Wildlife Acts, as well as the manner in which these are applied. The exemptions are framed so broadly, and appear to be regulated so poorly, that they arguably provide almost a carte blanche for cutting during the closed period. Our full submission is available below in PDF format. On January 13th 2015, An Taisce was granted leave to Judicially Review An Bord Pleanála's November 2014 decision, to grant permission for the N86 Dingle to Annascaul & Gortbreagoge to Camp Road Improvement Scheme (Note 1). The route is renowned for its scenic quality, natural and built heritage; including prehistoric features. In summary: the scheme proposes to widen the road and add cycle lanes resulting in a wide range of environmental impacts, including visual landscape impacts. An Taisce’s challenge to this decision of the Board to grant permission is based on the Board’s failure to fulfil obligations under the EU Environmental Impact Assessment Directive (Note 2). The case is due to return to the court in March. This is the second time that this scheme has been judicially reviewed. Kerry County Council challenged an earlier decision by An Bord Pleanála in Sep 2013 to refuse the same scheme. That challenge resulted in the Board’s decision being quashed and remitted to the Board in April 2014. On revisiting the same scheme again, this time the Board granted permission and this latest decision is now under challenge by An Taisce. “The impact of this development proposal on this most scenic route into the world-renowned Dingle peninsula, so rich in its natural and built heritage is of concern to An Taisce. In particular, the manner in which the assessment of this scheme has been compromised by carving an original schemed of 32 km up into chunks and the failure then to rectify omissions in the assessment of the whole 32 km scheme, is key among our reasons for bringing this challenge." "An Taisce is concerned with the precedent here in subverting the objectives and obligations of the Environmental Impact Assessment Directive, which requires the assessment of projects as a whole to be assessed by the Competent Authority, in this case - An Bord Pleanála. The EIA directive is such an important instrument to us all for ensuring the environmental impacts of development are assessed properly in order to inform the whole consent procedure, and to address necessary environmental mitigation and protections as necessary. Permission was granted by the Board in November 2014, Board Ref PL08 .HA0048 following an earlier successful Judicial Review by Kerry County Council of an earlier decision in September 2013 by the Board to refuse the same scheme, Board Ref PL08 .HA0035, That court challenge resulted in the Board’s decision being quashed and remitted to the Board following on the judgement in April 2014 by Mr Justice Charleton. The Judgement determined in effect that the Board had not discharged its obligations under the Roads Act of 1993 as amended in making that initial decision which refused permission. The Board then in revisiting the scheme, reversed its decision and granted permission in November 2014. In October 2010, Kerry County Council, KCC made an application for direction to An Bord Pleanála in respect of the Environmental Impact Assessment requirements for a 32 KM scheme from Dingle to Tralee, Board Ref PL08. HD0019. KCC then decided to withdraw that given the availability of funding for a 4.2km component of the scheme which it advanced under the Planning and Development Act 2000 as amended and associated regulations and permitting it itself as a Local Authority own Development, without Assessment under the EIA directive. Within 2 months of withdrawing the application for direction for the 32 km route, it submitted an application to the Board for direction on EIA requirements for the remaining 28 km of the route, lying immediately either side of the 4.2 km stretch. ( Board Ref PL08. HD0024) The Board determined an EIS was required for the purposes of Environmental Impact Assessment. That 28 km stretch and how the Board has fulfilled its obligations under the EIA Directive is the subject of the current challenge. An Taisce argues the objectives of the EIA Directive have been compromised, that the Board has failed to fulfil its assessment obligations, and that the Board hasn’t adequately explained its reasons for coming to the decision and conclusions it has. Fr. Seán McDonagh kindly wrote us this note to give us his, somewhat insider, views on the Pope's forthcomming encyclical. Pope Francis linked his remarks to the failure of the the Lima UN Framework Convention on Climate Change (UNFCCC) to address many thorny issues in relation to climate change, He plans to publish an encyclical on the environment in June or July 2015, which he hoped would help negotiators at the next UN Conference on Climate Change in Parish achieve an ambitious, equitable and legally binding treaty on climate change. I am sure that an encyclical on the environment would help focus attention on the destructive impact of human activity on God’s creation. Howoever, by far the most important part of the encyclical is that it develops a credible and adequate theology of creation. This is not as easy as it might appear because it means taking seriously modern sciences in developing a theology of creation, something which Rome has not done to date. In the past, the Catholic Church and other Christian Churches have often articulated their theologies of creation exclusively in biblical terms. In such a presentation, it appeared that the primary purpose of the natural world was to benefit humankind. This approach is no longer credible, because it ignores the extraordinary achievements of modern science. One of the most important achievements of the past few centuries is the great flowering of rational enquiry which has given us a much better understanding of ourselves and the world around us. Science has facilitated this new knowledge through its fearless, unrestricted use of our God-given intelligence which enables us to delve deeper into the processes of nature in order to understand what is going on in the world which, of course, is God’s creation. This new perspective on the universe which has emerged painstakingly from the scientific understanding of the natural world, challenges all human beings, and especially religious people, to move from an anthropocentric (exclusively for humin-centred) vision of creation, to a much broader one. It is worth stating that during the past two hundred years we have come to understand the composition of the world and the wider universe in a way that dwarfs our earlier understanding. Such a theology needs to be grounded in scientific knowledge about the immense and complex journey of the universe during its 13.7 billion-year story. It tells how over five billion years ago the solar system with its various planets came into being and evolved. Planet earth was positioned in such a strategic place in relation to the Sun that it alone of all the planets could become the only living planet in the solar system. The first glimmer of life stirred in the seas 3.8 billion years ago. This magnificent story has been articulated more clearly and comprehensively in its physical manifestation, by scientists, within their diverse disciplines over the past few decades. To take one example, modern biology and genetics teaches us that we are related to all living creatures and when we call them kin, as St. Francis of Assisi did, we are not speaking metaphorically. What I am suggesting here involves a Copernican-like revolution, but this is what is being clearly demanded by the new scientific knowledge of the past century and a half. Thus far no document from Rome has embraced this new vision our universe, solar system and earth. The Vatican’s option for the term human ecology which, at best, is a very questionable notion, if one understands the science of ecology, shows how reluctant Rome is to accept this paradigm shift. A possible reason for Rome’s reluctance to embrace a biocentric view of the world is the fear that might legitimize abortion and euthanasia. But one does not have to turn science on its head to defend the Catholic teaching on either of those issues. We humans are challenged to see ourselves as an integral part of the world, nourished by our environment in body and in spirit. This does not mean denying our special role, but it does place us firmly within the wider natural world which is now under threat because of human activity. Human flourishing always takes place within thriving ecosystems. Hopefully, the encyclical will inspire Christians and all people of goodwill to respond generously to the plight of the poor and care for the earth. Confirmation from the US National Oceanic & Atmospheric Administration (NOAA) and NASA that 2014 is the hottest year in recorded history underlines the extremely worrying trend of record-breaking global average temperatures being recorded with ever-increasing frequency. 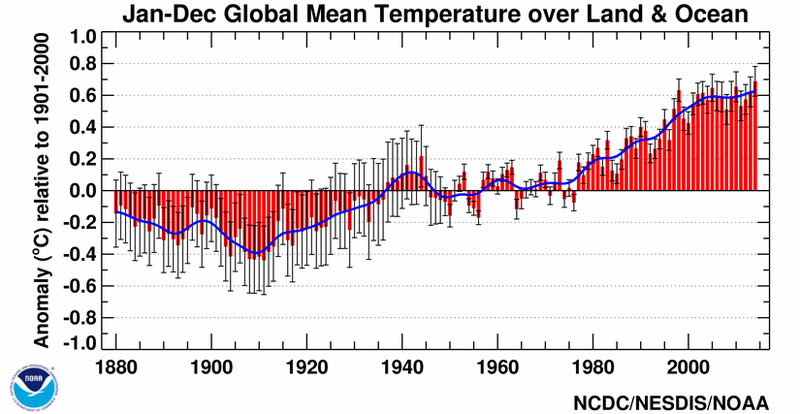 Further, 14 of the 15 hottest years on record have all occurred since the year 2000. An Taisce believes today’s announcement adds urgency to the demand that the Irish government’s forthcoming Climate Bill be ambitious and be strictly guided by international scientific evidence. We urge Taoiseach Enda Kenny to exercise personal leadership on this vital issue, and prove he was in earnest with his call at the UN last September that politicians show “conviction, clarity, courage and consistency” in responding to climate change. An Taisce further urges Mr Kenny to publicly distance his government from the behind-closed-doors special pleadings of powerful interest groups pushing a dangerous ‘business as usual’ agenda of deny-and-delay that runs contrary to Ireland’s long term strategic interests. By coincidence, a major study published in the journal Science yesterday stated that humanity has exceeded several "planetary boundaries that define a safe operating space for humanity” including the rate of extinction, deforestation and the amount of atmospheric CO2. “It is no exaggeration to state that humanity now faces the gravest threat to its continued existence”, according to An Taisce. “This is now a planetary emergency and nothing less than a full emergency response will suffice if we are to have any realistic hope of avoiding the impacts of dangerous and irreversible climate change. An Taisce believes the threat of global warming is not being communicated to the Irish public with the urgency it merits and has been pushed down the list of political priorities for reasons of short term political thinking. “It is difficult to believe that while we live in an era of unprecedented ecological and climate crisis, these extraordinary facts are not being discussed by our print or broadcast media, except in passing. The latest NOAA/NASA report sounds the alarm bell once again on the climate emergency. Do we now respond, or just collectively roll over once again and hit the ‘snooze’ button? The best time to have started tackling climate change was at least two decades ago. The second best time is – right now. 14 of the 15 hottest years on record have all occurred since the year 2000. This is global warming - the likelihood of this being a coincidence is estimated at being one in more than 20 million. In fact, the last month when the world recorded surface temperatures below the 20th Century average was February 1985 – almost exactly 30 years ago. According to NOAA (U.S. National Oceanic and Atmospheric Administration), during 2014, the average temperature across global land and ocean surfaces was 0.69°C above the 20th century average. This was the highest among all 135 years in the 1880–2014 record, surpassing the previous records of 2005 and 2010 by 0.04°C. Dublin congestion is back to 2008 boom time levels and action is needed now. Congestion damages economic productivity, slows down public transport and service vehicle movement, undermines cycling and causes local air pollution through particle emissions, particularly from diesel vehicles. Our car dependence is also contributing to unhealthy lifestyles and obesity. Further our National polluting transport greenhouse gas emissions have risen by 2.1% in 2013 over 2012 levels and puts Ireland on a path of way overshooting its EU 2020 Climate targets. 1. Review of future transport investment. An Taisce welcomes the content and scope of the North Dublin Transport Study, which closed today and on which we made a positive submission. For instance, we welcomed the inclusion of the three Swiftway services and the Dart Underground in the Do Minimum scenario. Dart Underground must be the first priority as it integrated services across Leinster and maximises benefits of the significant existing network. However a review of transport planning for the remainder of the greater Dublin Area is urgently needed. 2. Bus Rapid Transport and Dart Underground. An Taisce considers that Bus Rapid Transit (BRT) should be adopted as the most cost efficient way of strengthening the critical mass and efficiency public transport corridors. This will give a modal shift from car and create the interconnected transport system which Dublin as a European capital needs. However it is essential that the Dart Underground Heuston to Docklands scheme is reactivated to integrate mass public transport at the city centre. In 2014, An Bord Pleanála gave consent for an NRA supported Kildare County Council application to add two lanes to the 13 km section of the M7 between the Newbridge and Naas interchanges. The Environmental Impact Assessment for the Board’s consent was done without properly assessing the impact of inducing more traffic from the wider catchment area of the M7/8 and M9 into the Dublin area. We believe that the proposed lane additions will encourage more car based travel from counties Kildare, Laois and Carlow to feed into the M7. This would be contrary to the Department of Transport’s Smarter Travel policy to increase modal share of commuter travel by bus and rail. In addition the funnelling of additional traffic into the Red Cow interchange will increase congestion on and within the M50. An Taisce submits that proceeding this scheme will undermine the Government’s Smarter Travel Policy and the strategic transport planning the Dublin area needs to reduce congestion on the inter regional motorway network and the M50. The project should be suspended. The most immediate and cost effective option is to implement a range of “Smarter Travel” policies and actions, targeted to reduce congestion on the M50 and Dublin area at large. a. Provision of Park and Ride facilities targeted at enhancing non car based travel to major employment clusters. b. Promotion of Workplace Travel Plans including car sharing, where public transport or cycling is not a viable option. c. Promotion of school travel plans that significantly reduce car based travel. d. Promotion of increased and safe cycling use including extension of 30kph zones. An Taisce welcomes the study and the opportunity to submit a submission. An Taisce welcome the inclusion of the three Swiftway services and the Dart Underground in the Do Minimum scenario. Dart Underground must be the first priority as it integrated services across Leinster and maximises benefits of the significant existing network. An Taisce commends the sensible analysis of the different options and generally agrees with the one’s which have been eliminated, with the exception of the Heuston-Airport Rail option which we will discuss below. The six short-listed schemes are a sensible list and An Taisce would welcome the opportunity to be involved in the next stage of the process. Having built Luas Cross City and the Swiftway BRT to Swords the idea of running Metro North parallel to the Luas from Stephen’s Green to Parnell Square and then parallel to the Swiftway to Swords is crazy. We note that the passenger forecasts for Metro North have been reduced by the RPA to 12,000 passengers per direction per hour. In An Taisce’s submission to the Metro North Oral Hearing we called for the Metro North to be compared to three BRT routes on: the Ballymun corridor, Swords corridor and the Dublin Port tunnel. This can easily deliver 12,000 passengers per direction per hour. It would also serve both the Ballymun and Swords road corridors in Dublin City and provide fast express access to the Airport and Swords. See the Aris Venetikidis maps for illustrations: http://www.venetikidis.com/ArisV/DUBLIN_TRANSPORT_MAP.html. If a rail option is still to be considered it should server areas that do not already have a high quality BRT or LRT service and not duplicate existing investment. An Taisce would like one of the eliminated options to be reconsidered, namely heavy rail HR9 Heuston to Swords via Phoenix Park Tunnel. We note that this was eliminated due to the distance from Islandbridge to Heuston and the need to transfer to get to the City Centre Core. However, we believe one key factor has not been considered the potential benefits for the National Rail Network. • Passengers from Dublin Airport or Swords would have a direct express Port Tunnel BRT service to the City Centre. • Passengers from Dublin Airport or Swords could also use the new Dart service and interchange at Donabate (Balbriggan DART), Broombridge (Maynooth and Dunboyne DART and Luas Green) or Heuston/Islandbridge (Kildare DART). • It would also facilitate the potential to run a electrified national rail service from Belfast – Donabate - Dublin Airport – Broombridge – Islandbridge – Cork. In the context of planning to 2035 the national rail network must be considered. An electrified direct Belfast – Cork services is not an outlandish proposal. See the map in the appendices, which illustrate this. An Taisce is largely disappointed with the proposed arrangements for the Office of Planning Regulation which is set out in the recently published General Scheme of Planning and Development No.2 Bill 2014 [Note 1]. It falls far short from the appointment of an Independent Planning Regulator as called for by the Mahon Tribunal [Note 2]. The proposed arrangement will see the Office of the Planning Regulator established as a new office which is separate from the Department of the Environment, Community and Local Government. It will be a required to inform the minister if development plans prepared comply with national policy. However, it is at the discretion of the Minister as to whether he or she will issue a direction to the local authority, ordering them to change a plan. The proposed Regulator would, therefore, only appear to have an advisory role as opposed to any powers of regulation. Speaking on the General Scheme, Ian Lumley of An Taisce said 'we need an independent Planning Regulator who not only is free from political influence when undertaking independent inquiries, but also have the power to enforce its recommendations. The proposed arrangement will see the Regulator advising the Minister only, not regulating'. Concluding Ian Lumley said: “we desperately need a planning system in which the public can have confidence, something the Department cannot achieve with internal investigations and directions”. Enforcement and even the ability to enforce has been the Achilles’ heel of the achievement of sustainable development and land-use planning in Ireland and must, therefore, now, at this critical juncture be the focus of any proposed Planning Regulator. 1.14 Finally, with regard to enforcement, the Tribunal is concerned that recent changes in the planning system have resulted in an over-centralisation of power in the hands of the Minister for the Environment which is not subject to sufficient checks and balances. Consequently, the Tribunal is recommending that the Minister for the Environment’s ability to give directions to Regional Authorities and Local Planning Authorities should be entrusted to a Planning Regulator. However, the Minister for the Environment should continue to play a key role in adopting the NSS and NDP. 1.15 While the Planning Regulator should assume some of the Minister for the Environment’s existing role in relation to enforcement, the Tribunal considers that his or her role should not be confined to this. In particular, the Tribunal is recommending that the Regulator should also be entrusted with the power to investigate possible systemic problems in the planning system, including those raising corruption risks, with the aim of making recommendations to address those problems. The Regulator should also be responsible for providing training to members of both local and regional authorities on planning and development to enable them to discharge their functions in this area more effectively. The Regulator should have sufficient powers to carry out his or her functions effectively, including the power to question witnesses and compel the production of documents. An Taisce, The National Trust for Ireland, fully supports efforts to enshrine a framework for an effective Irish response to the vast threats posed by climate change in strong, unambiguous legislation. Unfortunately, the current Bill fails utterly to deliver on this ambition. Instead, in our view, the Bill endorses wishful thinking and climate inaction. Shifting Ireland towards ultra-low emissions requires a strong Climate Bill that ensures an ambitious, well defined emissions reduction pathway for Ireland within a science and equity-based carbon budget. A national carbon budget requires real political leadership, because excess emissions by one sector will have to be balanced by less for other sectors. Already, our EU emissions obligations for 2020 will be extremely difficult to achieve, due in large part to the expansion of emissions from our agriculture sector. Tackling climate change requires real and sustained political leadership. In his State of the Union address this week, US President Barack Obama stated: “No challenge poses greater threat to future generations than ‪climate change…it poses immediate risks to our national security, we should act like it”. Where is the equivalent political leadership or sense of grave urgency in Ireland’s lukewarm Climate Bill? An Taisce would like to remind Taoiseach Enda Kenny that in September 2014, he addressed the UN Climate Summit in New York with the demand that world leader show “conviction, clarity, courage and consistency” in responding to climate change (Note 2). An Taisce strongly agrees with Mr Kenny’s sentiments, and urges him to back up his rhetoric by investing his political leadership in what history will surely judge as Ireland’s greatest challenge. The recently published Climate Action & Low Carbon Development Bill is designed to give the impression of action while in fact being riddled with opt-outs and caveats. It is deliberately vague and appears to be designed to fail. Postponement of the Climate Mitigation Plan start date until 2017 heightens the sense that this Government is simply playing for time rather than acting to limit Ireland’s responsibility for its share of the atmospheric accumulation of greenhouse gases. Since taking office, this Government has regrettably shown scant interest in any of the critical steps towards steering Ireland on a zero-emissions pathway – from lack of action on energy saving and retrofitting to its car-based transport policy (annual transport emissions are forecast to rise 66% by 2030, according to EPA estimates). It is also promoting the emissions-intensive Food Harvest 2020, which essentially means that instead of sharp reductions, agricultural emissions will continue to grow. As a result of poor policy and leadership we are already on course to exceed our EU 2020 emissions targets, with costs in deserved fines that will be borne by all taxpayers rather than the polluters themselves. This Bill only pretends bare compliance with our EU targets and lacks any enforceable sanctions to ensure they are achieved. Failure to act now will mean that in the near future, these EU targets will need to become more, not less, onerous. Time is not on our side. As it stands the Bill does nothing to address the existential threat climate change now poses to every society and economy in the world, and yes, that includes Ireland. An Taisce urges the Houses of the Oireachtas to recognise climate reality by amending the Bill to set an honest course for ourselves and future generations. Quantifiable targets are required for accountability – a legally binding emissions reduction target of 80-95% for 2050 (see Government’s National Policy Position), with a clearly defined year on year percentage reduction pathway towards achieving the final target. Five-year roadmaps with sectoral carbon budgets, i.e. each Government department is allocated binding emissions reductions targets and must provide audited reports on progress towards these targets. Independent Expert Advisory Body, not beholden to commercial stakeholder groups or subject to political interference in publishing its findings. Dublin Cycling Campaign is a member of Cyclist.ie (www.cyclist.ie), the Irish Cycling Advocacy Network and the European Cyclists' Federation (www.ecf.com). Our national cycling coordinator is based in An Taisce offices at Tailor’s Hall. In addition to improving safety, lower speed limits in residential estates would encourage young people to move about independently and would encourage parents to permit their children to do so. This would have consequential benefits for their fitness and general health and would contribute to combating the rising levels of obesity in our society. The improved safety, and perception of safety, provided by lower speed limits would transform residential estates into more vibrant living spaces, with consequential benefits for the quality of life of residents and visitors. We propose that 30kph be implemented as the default urban speed limit, and that any higher speed limits be introduced only after a full environmental and risk assessment. In the interim we recommend that periodic 30 kph zones be implemented around schools and other places of assembly (cinemas, theatres, community centre, religious buildings, etc. ), in particular those that have large numbers of people arriving and / or departing at the same time. Regarding personal safety, 30kph is fundamentally safer than 50kph for pedestrians, cyclists and other vulnerable road users. It is well established that lower impact speeds result in fewer and less severe injuries. The images below (Ref DMURS 2013 and RSA) demonstrate this. Throughout Europe, 30kph is fast becoming the default urban speed limit. In some cities, speed limits as low as 10kph are in place in ‘home zones’. Even in the United States, where the car is king, 25 mph (40kph) limits are common in urban areas and 15 mph (24kph) limits are rigorously enforced at schools. In an effort to curb traffic fatalities, New York City lowered its default speed limit to 25 mph (40kph) from the 7th November 2014. Image 1: Illustration from the Road SafetyAuthority showing the impact of vehicle speeds on pedestrian fatalities. In the UK the “20’s Plenty” Campaign has been successful in securing reduced speed limits in many urban locations and has produced a Briefings page http://www.20splentyforus.org.uk/briefings.htm with many documents showing the benefits of 20 mph (30kph) limits. Here in Ireland you may have heard of the Jake’s Legacy Campaign - http://www.thejournal.ie/jakes-legacy/news/ - which was set up by the parents of Jake Brennan, who was tragically killed by a car in a 50kph zone on a housing estate in Co Kilkenny. Lower speeds result in less noise and pollution and greater fuel efficiency (high fuel consumption is associated with stop-start traffic, not slow traffic). On residential roads and shopping streets, people simply don't want to be exposed to the noise, fumes and dangers from higher speed traffic. While 50kph isn’t particularly noisy/polluting in itself, the acceleration from stop to 50kph is noisier and more polluting than the acceleration from stop to 30kph. Reduced acceleration also means improved fuel economy. The reduced fuel consumption from lower speed limits would contribute to the reduction in emissions that is required to help us meet our transport greenhouse gas emission targets. The overwhelming international evidence in favour of lower speed limits in urban areas, and the substantial community benefits accruing from their introduction, needs to be recognised. This is a campaign that all An Taisce members can take up with the Local Authority in their area. Dublin Cycling Campaign fully supports the initiative of the Minister for Transport Tourism & Sport in relation to the introduction of 30kph speed limits in residential estates and further supports the expansion of the existing 30kph centre city zone speed limits, as well as the wider introduction of 30kph limits throughout the city. SWAN Research Project: Abstraction of groundwater & surface water in Ireland & implications for meeting Water Framework Directive objectives. The Sustainable Water Network (SWAN) seeks a team of researchers to conduct a desk-based research project on water abstraction as a significant water management issue in Ireland. This report will provide an evidence-based analysis of the impacts of small and large scale abstractions on Ireland’s surface water, groundwater and groundwater dependent terrestrial ecosystems (GWDTEs), including cumulative impacts and the implications for Water Framework Directive (WFD) implementation and the meeting of WFD targets. It will provide a full review of EU and Irish policy, legislation and guidance relevant to water abstraction, including a critical analysis of the strengths and weaknesses of the current legislative and regulatory system to control abstractions and to meet WFD objectives. It will furthermore include a significant comparative study of abstraction control regimes in other EU Member States and elsewhere, with a focus on best practise applicable in Ireland. The research must be based on a comprehensive review of all relevant national and international peer-reviewed and secondary literature, in addition to international case studies. Based on the above research and literature review, the key output from the research will be a set of evidence-based recommendations setting out proposed actions to control water abstractions in order to achieve sustainable water management, mitigate the pressure on surface water, groundwater & GWDTEs and meet WFD objectives. An important element of the research project will be consultation with a key experts, decision-makers and relevant stakeholders. The project deadline is July 30th 2015. The budget is in the region of €22,000 (including VAT). At the National Ploughing Championships 2014, the Irish Environmental Network launched a report into how Ireland’s biodiversity can help in the fight against climate change. The report entitled ‘Ireland’s Biodiversity: Our natural ally in the fight against climate change’ outlines how protecting natural habitats is an important and cost effective option for government to store carbon and offset greenhouse gas emissions. The report discusses the interdependency of climate, biodiversity and ecosystem services and shows how integrated policies can achieve climate mitigation and adaptation and at the same time prevent further biodiversity loss. It highlights the most urgent Irish policy issues that need to be addressed in order to mitigate and adapt to climate change without further degrading ecosystem services. The report covers topics such as peatlands, tree cover, bioenergy, wind energy, coasts, invasive species, food security, and ecological networks. Restore protected peatlands to stop carbon loss. Promote agroforestry and protect scrublands. Shift policy priorities from bioenergy to energy efficiency. Strategic Environmental Assessments (SEA) should be carried out on all wind energy plans with cumulative, secondary and indirect impacts fully considered. Produce guidelines on ecological networks and their integration into spacial planning. Incentivise coastal ecosystem protection for biodiversity and carbon storage. The report was put together by the Working and Educating for Biodiversity (WEB) group. The group is comprised of IEN member groups that are involved in the protection of the unique natural habitats, flora and fauna of Ireland’s land and sea. The document was produced with the support of the Department of the Environment, Community and Local Government under the Irish Environmental Network Biodiversity Policy Strand. The report will be distributed to key decision makers in Ireland. An Taisce is a member of WEB and contributed to this publication. 99.8 % of samples comply with microbiological limits. Today, over 20,000 people - on 20 public water supplies - are affected by boil water notices. At the start of 2015 there are 121 ‘at risk’ supplies on the EPA’s Remedial Action List. These 121 supplies (serving almost 940,000 people) are the priority for improvement works. (At the start of 2014, 140 supplies were on the List). Improvements to disinfection systems, better management of water treatment and more investment in robust and resilient infrastructure is required. Further water improvements are also required because of recent, more stringent standards for lead. The report also shows that water quality in the private water supply sector lags significantly behind the quality in the public network. The EPA will be pressing local authorities to make greater use of the powers available to them under the drinking water regulations to drive improvements in water quality in the private water supply sector. 9.82% of samples comply with microbiological parameters. 99.51% of samples comply with chemical parameters. 40 boil water notices and a further four water restrictions were issued. E.coli was detected at least once in the 10 supplies, up 3 on 2012. Trihalomethanes limits were exceeded in 61 supplies, down 35 on 2012. 140 supplies were on the EPA’s Remedial Action List (RAL) at the end of 2013, this reduced to 121 by January 2015. 16 directions were issued by the EPA in 2013. More than half of supplies audited required disinfection system improvements. 97.53% of samples comply with microbiological parameters. 99.57% of samples comply with chemical parameters. E.coli detected at least once on 63 small private supplies, 32 private group water schemes and 1 public group water scheme. Microbiological quality of private supplies remains inferior to public supplies. Removing and preventing Boil Water Notices by improving disinfection systems. Implementing a National Lead Strategy to deal with lead related water restrictions. Optimising the treatment process to reduce trihalomethanes in water. The EPA Drinking Water Report 2013 and the complete list of public water supplies currently on the RAL (including details of the proposed remedial measures and associated timeframes) is available at http://www.epa.ie/pubs/reports/water/drinking/. It is with deep sadness that we said goodbye to our dear friend Doyne Nicholson whose funeral was held on 19th January. Doyne was always there for us-as Treasurer for many year & as a strong supporter of all our outings & events. We will miss his sharp wit & humor. Our sympathy goes to his wife Georgina ex-Chairperson & all his family. The Meath Association AGM will be held on Tuesday 28th April in Bellinter House, Bective. The committee are currently organising the Social Calendar which will be forwarded to our members with the AGM notification. CONSULTATION Deadline 3rd March- Review of first year of National Inspection Plan for septic tanks shows that almost half of household septic tanks fail inspection. The EPA today released a review of the implementation of the National Inspection Plan for Domestic Waste Water Treatment Systems 2013, for the period 1st July 2013 – 30th June 2014. The National Inspection Plan is being implemented by local authorities under the supervision of the EPA. The review of the period 1st July 2013 to 30th June 2014 found that: • 987 inspections were carried out by local authority inspectors. • 52 per cent of domestic waste water treatment systems passed inspection. • More than half the failures were due to lack of de-sludging. • 79 per cent of the inspected systems are now compliant with the regulations, following remediation work by householders. • Advice to assist householders in maintaining their domestic waste water treatment systems is available through local authority leaflets and websites. Extensive information for homeowners is also available on the EPA website. The EPA now invites submissions on the proposals for the next Plan, which is proposed to cover the period 2015-2017. These proposals are contained in Chapter 6 of the review report published today. Interested parties can make submissions by emailing DWWTSInspections@epa.ie or by post to National Inspection Plan 2015-2017 Consultation, EPA, McCumiskey House, Richview, Clonskeagh Road, Dublin 14 to arrive no later than 3rd March 2015. The report National Inspection Plan for Domestic Waste Water Treatment Systems: A Review of the Period 1st July 2013 – 30th June 2014 & Consultation on Proposals for 2015-2017 is available now on the EPA website. Initiatives are underway to organise large groups to travel to Paris to demonstrate during the UNFCC 21st Conference of the Parties. Many of the groups involved are younger eco-activists and Greens. There is a Belgian organisation - Climate Express http://en.climate-express.eu/general.html - which is planning to bring 10,000 people to Paris. They organised a train to the Warsaw CoP two years ago and they are planning a much larger mobilisation this time. Some will travel by train and others by bicycle. There have been a number of Skype calls linking activists from many European countries to co-ordinate plans for convergence on Paris. The countries already involved include Germany, Turkey, Poland, Portugal, France, UK, Denmark, Sweden, the Netherlands, Ireland, Switzerland, etc, A gathering to progress the plans was held in Brussels at the end of January and attended by Iva Pocock, formerly of VOICE. Kate Ruddock of Friends of the Earth Ireland has convened some Irish groups to plan bike and train convoys from here. Trocaire, Peoples Climate, An Taisce and FoE participated in a Skype call 10 days ago. Another will take place soon. Two routes are being considered - either through the UK or on the ferry from Rosslare. Everything is still to be decided. Please contact either Kate at kate@foe.ie or Phil at phil.kearney@muckduff.net. An Taisce is a charity that works to preserve and protect Ireland's natural and built heritage. We are an independent charitable voice for the environment and for heritage issues. An Taisce is not a government body, semi-state or agency. An Taisce has challenged the decision on this road development in the courts because we believe that An Board Pleanála did not correctly comply with and carry out the legal requirements laid down in Irish and EU Law for an Environmental Impact Assessment on the whole project. In this regard, it is also significant that the expert Inspector of An Bord Pleanála highlights An Taisce’s concerns as to how the project was being spilt into sections so as to preclude an overall environmental assessment (Note 5). Our laws provide, as a statutory right, provision for citizens and organisations to review decisions like this. In granting An Taisce permission for this challenge, the courts have already decided that there is an issue which needs to be fully heard and decided. The matter is now in front of the courts for them to decide on the legality or otherwise of the decision. To draw an analogy - consider a windfarm developer who decided to split up his project of 32 turbines into separate projects of 1 turbine each. Surely you would argue that the impacts of the all 32 turbines need to be considered and fully assessed as a whole. It is also worth noting that An Bord Pleanála itself originally decided that the exact same scheme represented an unjustifiable intrusion into the landscape of the Dingle Peninsula until this decision was judicially reviewed by Kerry County Council. A complete and thorough application of the Environmental Impact Assessment Directive requires the project as a whole be assessed. This decision and how it has been handled is not just important for this project but for many other projects. Since taking this challenge, An Taisce has received comments from people in Kerry and further afield, including tourists who've visited the area, welcoming our action. We have also received criticism and expressions of concern. To those we would say their frustration is more appropriately targeted at Kerry County Council and An Bord Pleanála whose actions have, in our view, compromised this project and how it has been assessed and failed to comply with the law. An Taisce wishes to see this matter dealt with promptly and will not be objecting to proposals to expedite its progress through the Courts so that it can be decided more swiftly in the interests of justice for all.